The thing I remember the clearest about shooting American Farm is the smell. The smell of a dairy barn is something to behold � it's beyond strong, it sticks to you. Jim warned me to wear old clothes and my crappiest boots, and man was he right. Your shoes are crusted with mud, hay and worse and you're wondering if you'll ever be able to get the camera's lens really clean again. There was a lot of getting up early, what I call �farmer early,� say around 4 am or so. Not so bad for me, I'm used to getting up early, but there is something alien about going to bed when it's dark, and having it still be dark when you get up. We worked very hard on this film; for the shoots I was on, it was just Jim and I doing everything, no audio guy, no grip, no PA. His mom, or a cousin would pitch in and carry something every once in a while, but for most of it, just us. So not only did we get up farmer early, we worked farmer hard. As for the film itself, we were going for a lyrical, naturalistic look. I tried to light all the interviews as if it were window light--one soft light, fill from a white card, no backlight, very natural. We always tried to feature an element of nature or farm in the frame. I actually tried to put a window in every interview. There's even one in Greg's interview, way in the background. I liked the idea of having the farm and nature framed for us. Kind of what the film was trying to do. 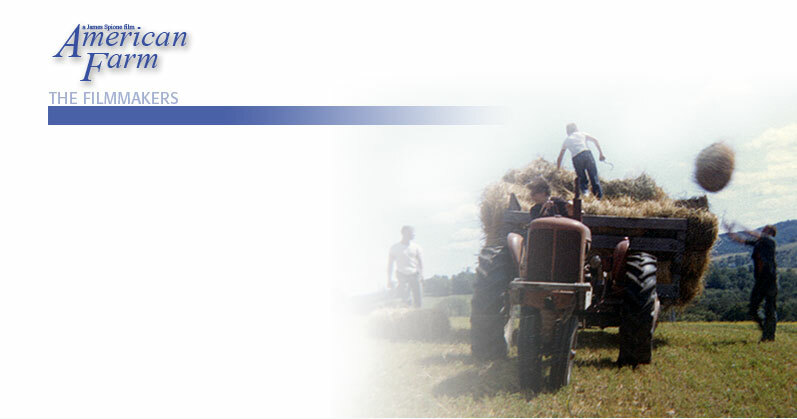 We shot American Farm on both Betacam and DVCAM. The place where the Betacam really paid off was in the scenic shots. We also spent a lot of time shooting beauty shots around the farm, which, aside from the getting up early part, were a lot of fun. Some of them were quite lovely. Over the course of the year, Jim made a number of trips to the farm on his own with a little Sony PD-150, shooting daily life and capturing some wonderfully intimate scenes on the homestead. Jim and I went to film school together, and in those days, he was the cinematographer. He has a great eye, and it shows in American Farm. My favorite shot is his, the last shot in the film: the kids playing hide and seek at dusk. This amazingly evocative final image speaks volumes about the uncertain future of both the Ames farm, and the family farm in America.